InvestingHaven’s research team has a very strict method when it comes to understanding the dominant market trend. As per the section ‘intermarket dynamics’ explained in our 100 tips for successful long term investing we track a small number of leading indicators which determine the trend of the vast majority of markets. Specifically, we track 15 leading indicators for global markets. We interpret all of these 15 leading indicators simultaneously in order to derive the dominant market trend at any given point in time. That’s correct, just 15 leading indicators to understand where all markets globally are heading, and derive the dominant market trend. The trick is to identify the leading indicators and interpret them simultaneously within their chart patterns. Together they paint a picture, and that is subject to change once or twice per year. We see markets moving in cycles of 6 to 18 months, and some markets outperform other markets during those cycles. The aim of this page is to track, on a monthly basis, our set of 15 leading indicators. While that may be true, and many are looking at similar leading indicators, we want to differentiate from the rest by having our own way to identify and interpret leading indicators. The interpretation of these 15 leading indicators to determine dominant market trends IS InvestingHaven’s proprietary method. This page is updated on a monthly basis, and features the monthly charts of 15 leading indicators. With this, we aim to know in which direction to look for the most profitable investments. All global stock markets now have a BULLISH look again, first and foremost US stocks and emerging markets stocks. There are still no signs whatsoever of a 2008-alike scenario, no doomsday scenario in 2019, even though many were predicting this a few months ago (we continued to firmly deny this scenario based on our chart set and methodology). What makes us pretty confident is that the Euro and Dollar are not showing any concerning sign as per our proprietary bear market criteria. Commodities are neutral, select commodities will do well in 2019 because inflation seems to be setting a giant double bottom. Gold’s major test at $1400 failed, but it might be picking up steam for another attempt. Currencies and credit markets: the most important observation at the start of April 2019 comes from credit and currency markets. Treasuries in the U.S. haven fallen to their 2.50 level which we identified many months ago as the line in the sand. So far, this is supportive of a stock bull market. We closely watch the Euro below 112 for a risk-off signal which we do not expect based on the current course of things. US stocks have rebounded and are continuing their uptrend at the end of March. “A small push above current price levels would turn stocks very bullish,” is what we said early March and is what we got early April. Leading indicators are the Russell 2000 (RUT) and 1600 points is the line in the sand for a bullish continuation, NYSE with 13,100 being the bullish price level. above these price levels we will see bullish momentum. Emerging markets (EEM) are on their way to become super bullish as they confirmed their giant breakout from 2017, and likely have ended their tactical bear market of 2018. We also watch Shanghai Stock Composite Index (SSEC) to get a confirmation that China’s stock market ended its downtrend. The gold (GOLD) safe haven trade is set to morph into an inflation trade. The monthly close right below $1,300 suggests it needs to pick up steam before it can move higher. This is a very common phenomenon in the gold market. Below $1,250 would be concerning for the short to medium term and might invalidate our gold forecast. Visibly, crude oil is supportive for stocks at a minimum for the next 3 to 6 months! Inflation is supportive for stocks and several commodities, for a long period of time presumably. April 2019: All global stock markets now have a BULLISH look again, first and foremost US stocks and emerging markets stocks. There are still no signs whatsoever of a 2008-alike scenario, no doomsday scenario in 2019, even though many were predicting this a few months ago (we continued to firmly deny this scenario based on our chart set and methodology). What makes us pretty confident is that the Euro and Dollar are not showing any concerning sign as per our proprietary bear market criteria. Commodities are neutral, select commodities will do well in 2019 because inflation seems to be setting a giant double bottom. Gold’s major test at $1400 failed, but it might be picking up steam for another attempt. March 2019: All global stock markets recovered strongly after respecting major support. There are still no signs whatsoever of a 2008-alike scenario, no doomsday scenario in 2019. By far the most important trend is flat U.S. Treasuries with a big move brewing in 2019, upward looking rates and both the Euro and Dollar near turning points. Stocks look bullish in emerging markets, mildly bullish in the U.S., neutral in Europe. Commodities are neutral, select commodities will do well in 2019. Gold’s major test at $1400 failed, but it might be picking up steam for another attempt. February 2019: All global stock markets recovered strongly after respecting major support. No no signs of a 2008-alike scenario whatsoever. The picture might turn bullish soon, but there is still downside risk. The line in the sand: 2.50 for 10 year rates, 110 in the Euro, 1300 in the Russell 2000. Emerging markets might have confirmed a giant breakout test, super bullish for the next years. Gold is close to a major test at $1400. January 2019: The general picture is that all global stock markets stopped falling right above major support. No major harm done yet, no signs of a 2008-alike scenario as of yet. The picture does not look bullish yet. It can go both directions, but at this point in time the bulls have the benefit of the doubt. The line in the sand: 2.50 for 10 year rates, 110 in the Euro, 1300 in the Russell 2000. Currencies and credit markets are the most important place to look for major turning points in markets. They have determined major changes in the last decades, and they revealed ahead of time the major stock market crashes. The Euro is, by far, the most important leading indicator in currency land. The US Dollar looks set to fall, which implies that capital will be turning to risk assets and/or treasuries. What does the US Dollar chart signal for global markets? The USD looks tired now and might fall back to support at 90 points which would be great news for risk assets like stocks but also commodities especially precious metals. It may also consolidate in the 94 to 98 area which is neutral for all global markets! What does the 10 year yield chart signal for global markets? 10-year Yields are in a twilight zone area. Below 25 nasty, above 30 favoring stocks. It looks like 25 did hold strong, which is good news for US stock markets. Even a fall till 22.5 as long as support kicks in there is acceptable for stock markets to continue their bullish momentum. What does the Germany 10 year yield chart signal for global markets? 10-year Yields in Germany: a very special setup. The decision window is narrowing down, we see a major double bottom at 0.0 percent interest rates! The odds favor that this is the end of the decline, good news for German and even European stock markets. What does the Russell 2000 chart signal for global markets? The Russell 2000 is, by far, the most important leading indicator among U.S. stock indices. It has always forecasted major trend changes in the form of major tops or bottoms. Good news: major support was respected, and we are way above support now. Just a 1 pct rise from here will turn this chart BULLISH, and with this also all US stock markets! What does the NYSE chart signal for global markets? NYSE composite index says the same as the Russell 2000. 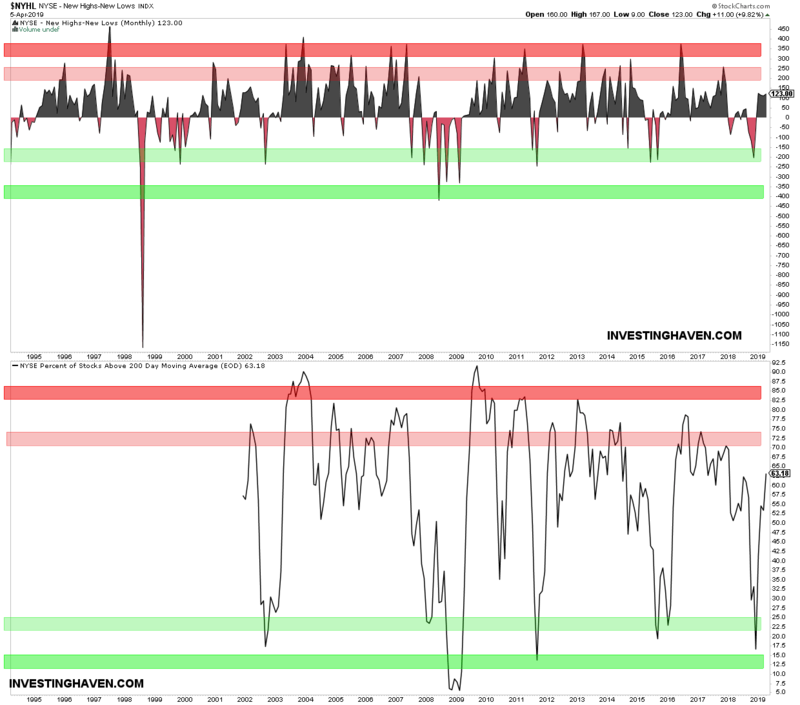 This is the only market breadth indicator we have included in our set of 15 leading indicators. The NYSE composite index internals was at deeply oversold levels, is what we said one month ago. It was a logic place for a recovery. That’s what happened. What does the emerging markets chart signal for global markets? Emerging markets stocks stopped falling near their breakout level! They are forming a base which might be very bullish for 2019. The 36 to 40 area in EEM ETF held strong. This is likely the end of the bearish trend of 2018. If so, 2018 classifies a tactical bear market, and chart-wise it is a retest of the giant breakout of 2017. This is HUGELY BULLISH, and a long term bull market is starting NOW. Emerging markets currencies, leading indicator for emerging market stocks, are bullish short term and once above 18.50 also long term bullish. They would favor emerging market stocks. What does the Japanese Yen chart signal for global markets? The Japanese Yen is a tricky one, always. It can never be read alone. Right now, the fear trade came to a halt, and we see the same picture in gold and Treasuries. What does the crude oil chart signal for global markets? Crude oil is an additional trigger for risk assets like stocks. The risk-off line in the sand level got respected ($41). Visibly, crude oil is supportive for stocks at a minimum for the next 3 to 6 months! 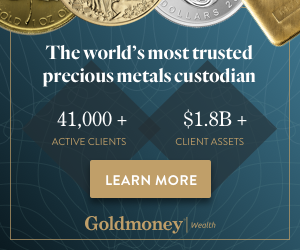 What does the gold chart signal for global markets? Gold has multiple faces so it requires a very contextual interpretation. Right now it underpins the safe haven trade. We would not read more into gold’s rise. Note the critical price points on the chart for bullish momentum vs sideways consolidation in the next few weeks. Especially the giant resistance (green bar below) is the $1350 to $1400 area, and gold is some 5 pct removed from this area. We believe a new breakout attempt will take one or two months before “it starts”. What does the inflation chart signal for global markets? Last but not least, our inflation indicator is meant to show a high level direction. It is also contextual and should be interpreted in conjunction with the other leading indicators. Right now, it suggests that inflation sensitive assets are at support. Stated differently, it the other leading indicators improve it might be a strong buy signal for inflation sensitive assets like commodities.